Note: You can sign up today and get these products fast, because they’re shipping another batch of THIS box on Tuesday March 14th. But you’ll want to hurry because they sell out FAST. Just look at the top of this page and see if it still says “shipping March 14th” – otherwise you’ll get the April box. 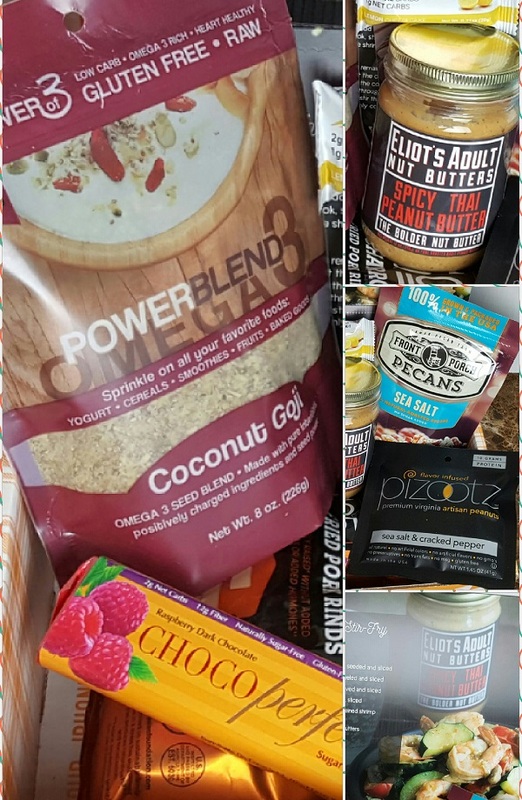 I love that they send low carb products I may not have tried or even heard of otherwise, and that they’re hand-picked for quality and carb count. 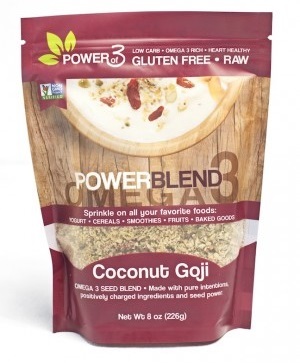 I’ve really enjoyed mixing things up with all these cool products lately! It’s like getting a big birthday surprise box every single month, lol. It’s so much fun! You can see what was in the July and August, and September and October and November and December & January and February boxes. You’ll discover A LOT of new low carb foods to try in ^ those lists! In those 7 posts I gave you detailed price comparisons of each product in the box, and also gave you links where you could find the products individually. I’ll do the same for this box, because it’s FUN to discover new low carb foods & fresh options. 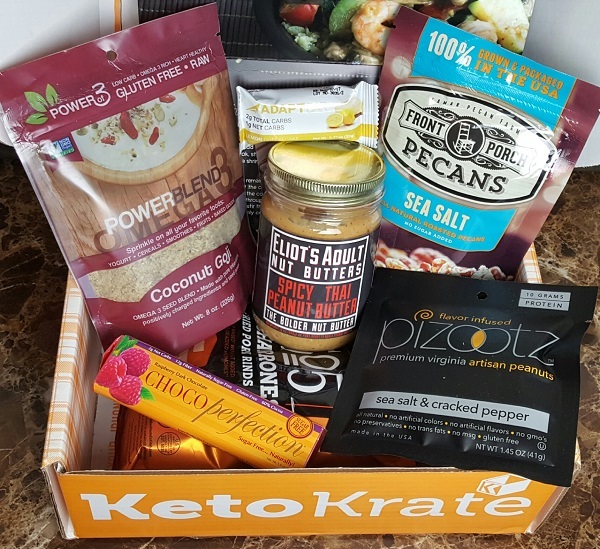 The March Keto Krate: A Box Full of Low Carb Food Fun! Each Keto Krate box comes with 6-9 full-sized low carb products. My last box had 7 cool new foods in it. This one has 7 brand new products to try too! 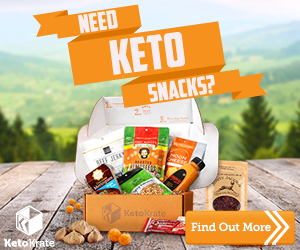 I’m working with Keto Krate to help spread the word out about this awesome service, because I LOVE it. I can tell you firsthand they are super cool guys! Probably because they’re Canadian. 😉 Speaking of, they’re working on ways to be able to ship to Canada affordably. In exchange I get to try the products plus I earn a small one-time referral fee when you sign up. And I don’t get to dive into my box the minute it arrives and devour the chocolate, because I have to take photos & do product research to put together all these fun details for you! The only place you can buy these online is on Amazon in a 4-pack for $5.63 each, but they only have the Habanero BBQ flavor in stock at the moment. You can also find these in some stores, but only in certain locations. I heard this was delicious. 🙂 I can’t wait to try it! 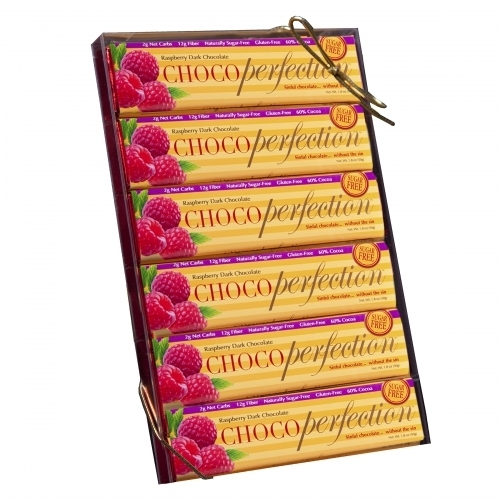 Netrition no longer carries these bars, so you can only get them on the chocoperfection website or on Amazon – and only in bulk. It’s $48.95 for 12 bars on their website, or you can get a 6-bar variety pack on Amazon for $22.95 ($3.83 each). This 1.45 ounce pack serving is 4.35 net carbs, with 10 grams of protein. You can get a larger 16oz bag on their website for 19.95 (free shipping), or order the 12-pack on Amazon for $27.99 ($2.33 each) with free shipping too. They have a nice variety of flavors, and you can also get a 5.75 ounce bag on Amazon for 7.99 + free shipping. Someone on Facebook already tried these and said she didn’t like pork skins, but that these were actually GOOD. Great to hear! They’re currently only available on Amazon and you can get a 4-pack of one ounce bags for 18.00 ($4.50 each) with free shipping. This is a small .71 ounce bar, and only 1 net carb (2 total carbs). You can buy these in a box of 15 bars for $27 on their website, which makes them $1.80 each. 7 out of the 8 reviews are GREAT. Shipping is $7.95 for the box, making these $34.95 total. There is a Featured Recipe included in the Keto Krate for this product to make Thai Shrimp Stir Fry. 🙂 I’m definitely going to try that. Or get my friend Caroline to make it, lol. It’s $11.16 on Amazon with free shipping, and $8.99 plus $4.99 shipping on the website ($13.98) – so it’s cheaper on Amazon.. They have TONS of cool flavors of nut butters I’d love to try, like the Espresso Nib Peanut Butter. That sounds delicious! This stuff intrigued me. I saved it for last for a reason… but I tried it first. I was afraid it would taste like dirt when I first opened the bag and sniffed it – but it didn’t. The other thing that intrigued me was how to use it. It just kinda says, “sprinkle it on all your favorite foods.” It’s 1 carb per TBSP, by the way… and a SERIOUS power food! None of the items are available on Netrition this time, so you’d have to order them on Amazon or on the company’s website as linked above. Of course, you have to order most of the items in bulk or by the box instead of individually. Using the cheapest options, it would cost you $129.95 to purchase these products online on your own. That makes the Keto Krate a GREAT value at only $34.95! You can cancel anytime, or even order individual past Keto Boxes on their website too. 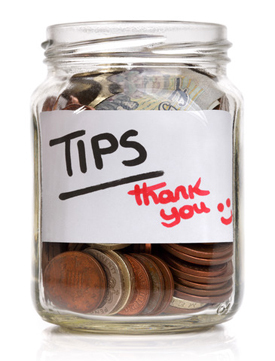 They also include coupons & discount codes in every box, increasing the value even more. It’s AWESOME to sample individual products at such a great price! You get something different in your Keto Krate every single month, so it’s a great way to discover interesting new low carb products you may fall in love with! What better way to reward yourself, and keep low carb’ing FUN?! Are you already a fan? If so, what did you try out of this box so far? Note: You can sign up today and get these products fast, because they’re shipping another batch of THIS box on Tuesday March 14th. But you’ll want to hurry because they sell out FAST. Just look at the top of this page and see if it still says “shipping March 14th” – otherwise you’ll get the April box. You can cancel anytime, by the way – you don’t have to commit to a contract or anything. 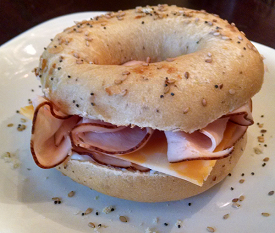 This entry was posted in Low Carb Foods and tagged groceries, reviews. Bookmark the permalink. 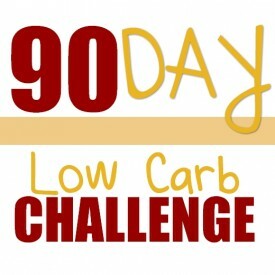 Hi Lynn, I have been trying the low carb high fat eating for a few weeks now. I try to read as much as possible to find out what to eat and not to eat. This is the problem that I am having while reading the information. I see people saying that if you eat too much protein that it will keep you from losing weight. I see people saying that if you eat too much dairy or cheese that it will keep you from losing weight. I see people saying that if you eat too many vegetables that it will keep you from losing weight. So, my question is what is left to eat? I understand that the fat portion is important but I can’t eat a stick of butter, or a pound of bacon! Not meaning to sound sarcastic, but I get really confused on what to eat and what not to eat. So how do you do it? Your advice would be greatly appreciated. Thank you so much. You can read so much it just gets confusing, but I keep it super simple: 20 net carbs max, 70% fat minimum. That works very well for me! You can see my food diaries here to get ideas of what I eat: http://www.travelinglowcarb.com/category/low-carb-daily-journals/ and how I log those meals – and see how the macros work out. I have been so bored with my usual LC foods that I seriously considered jumping off the wagon…BUT I know how great I feel with this WOE. Also, when the weather clears up and I can get outside I know I’ll feel better. In the meantime I headed back to the kitchen! When I first started this WOE over a year ago I tried cooking/baking using LC ingredients and was less than happy with the results. I am a cook/baker so I know what I’m doing in the kitchen and love it so I decided I HAVE to figure this out if I’m going to continue this WOE. The keto krate looks convenient but I like cooking and expermenting so when I saw my favorite snickerdoodle cookies I headed to the kitchen. I read through so many recipes and reviews and finally, OMG I made an amazing cookie! Next I made cranberry orange scones….Omg again! Finally, I tried the recipe for “potato salad” using cauliflower and I was over the moon excited. I would have bet money that I would have had to throw this out but it is honestly delicious. Of course, I took all this to share at ladies Bible study so I wouldn’t eat it all and I got rave reviews! My point of all this is: if you love to cook/bake, don’t give up..It is possible to make something delicious that will keep you on track with this WOE! That’s awesome, Marti – and it all sounds SO good! 🙂 There are tons of great recipes around the web. The riced cauliflower always appeals to me… but now I’m tempted to try “riced broccoli” instead. Have you ever tried either?? Psst! Click The Button And Look For "The Secret" ;-)Find The Secret!